A while back while we were on tour with Intel, we met a group of students doing some pretty cool stuff for their FIRST robotics team. What started off as a solution to a design problem has grown to be much more within the FIRST community. We asked one of the students, Rachel Gardner, to write a bit about what they've been working on. Check it out! While participating in a high school robotics program two years ago, a group of us students realized the difficulties of using a PC for driving practice. The FIRST (For the Inspiration and Recognition of Science and Technology) Tech Challenge (FTC) contains a user-controlled portion during contest, so our drivers need to practice driving the robot. However, to do this we needed a laptop, the development environment, the code and a whole lot of patience. After our first season, one of our mentors decided there had to be a better way to connect to our robot wirelessly and drive it, without needing a PC. Our mentor approached us with the idea of creating a new product to assist in drive practice. 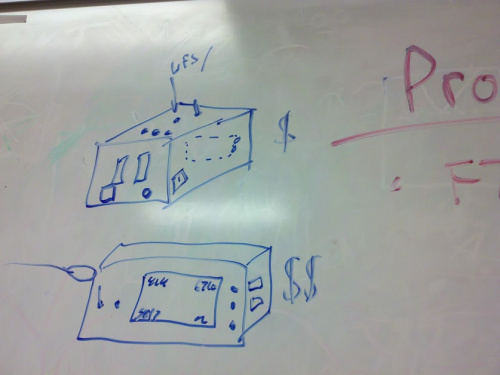 We formed a small development team of students -- I worked on software/management, Ben designed the printed circuit board (PCB) and other students helped with marketing and manufacturing. With such a small team, we were all able to learn about and participate in aspects of marketing, design and manufacturing. The overall plan was for the product to use two USB ports to take in driver-control input, then translate it to Bluetooth to be sent to the robot. We wanted to make it as cheap, portable and reliable as possible. 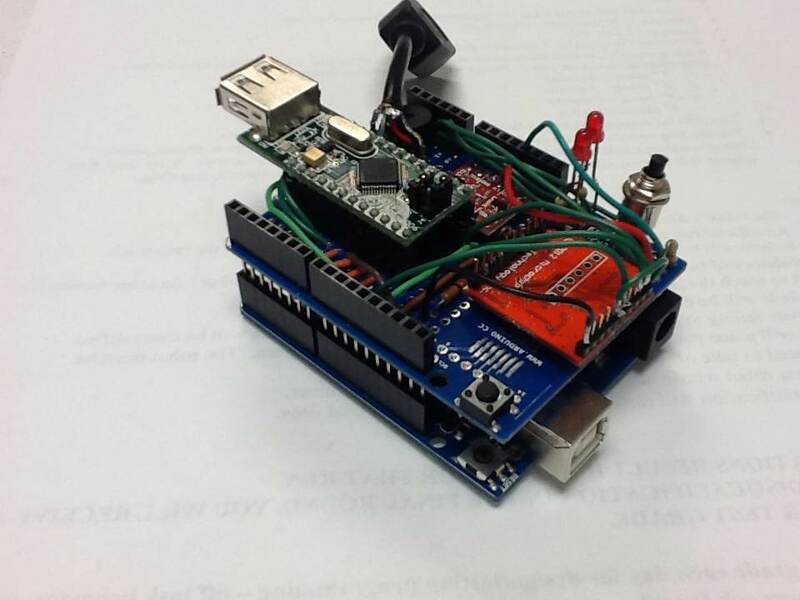 This design required three main components: a microcontroller, a USB interface and a Bluetooth module. 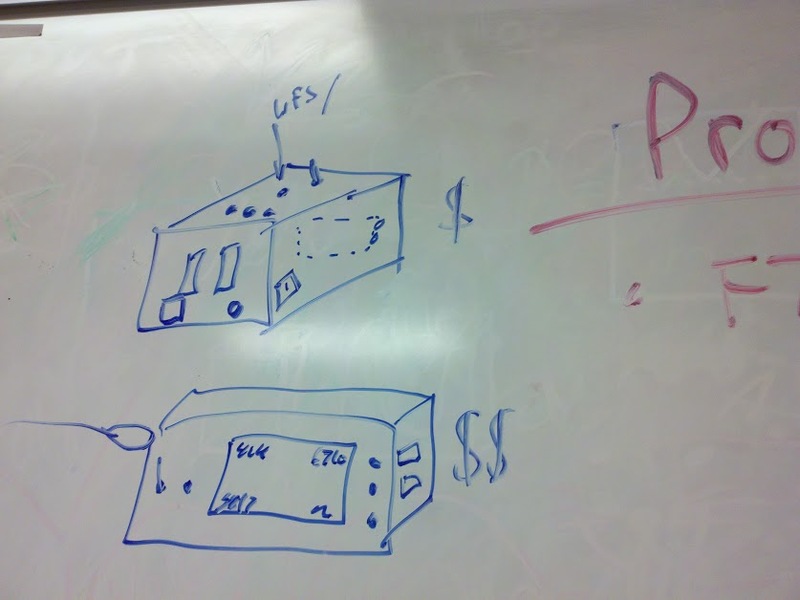 Our earliest prototype included an Arduino Uno and a VDIP1, as well as a Bluetooth antenna from SparkFun. However, we realized that this design was too bulky to be as portable as we had hoped. From this, we transitioned to our final set of main components. In our final prototype and current version, we use the Arduino Pro-Mini as the microcontroller, a VDIP2 from Vinculum as the USB interface and the RN42 from Roving Networks (now Microchip) as the Bluetooth module. 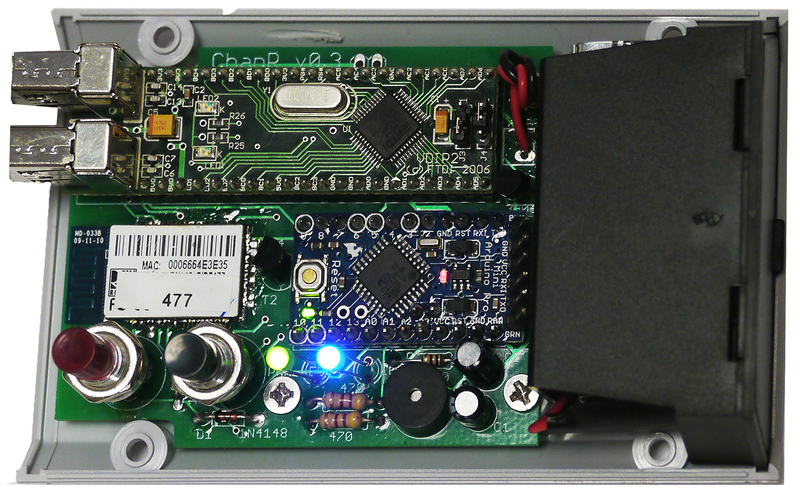 The VDIP2 takes in the joystick input, the Arduino translates the input and the RN42 sends out packets over Bluetooth. After we finished development, we began marketing the product through our website and a commercial on YouTube. Many teams were excited about the device, which we named the ChapR (short for ChapRemote). Most teams were willing to pay the $100, but we didn’t want to use the sales as a fundraiser -- instead, the profits (roughly $25 per device) went to producing ChapRs for teams in financial need. To date, we have shipped out over 120 ChapRs, all manufactured in a small part of the school’s robotics room. 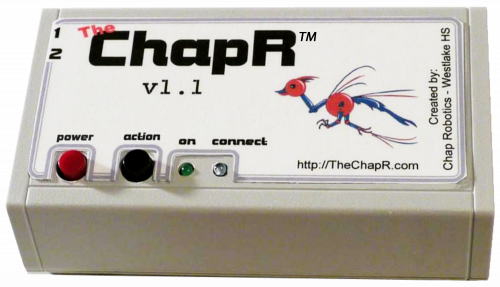 After our successes with the first product, we took our ChapR team and transformed it into the Chap Research program, a program within the school dedicated to giving other students the innovation experience. We’ve taken on several projects, such as a demo for our local TedX Youth event. Though we’ve achieved a lot, we are still working hard; both further developing the ChapR and looking for more projects to pursue! This is truly incredible work from Rachel and the rest of her team! It was great to meet you guys - keep it up! I just want to say thanks for all the FIRST recognition, and the Gyro's in FIRST Choice. I'm just about to play with ours and see how it works. And supporting FIRST finally explains why the logo has been in the Eagle library for so long.